It’s not such big news these days. In the past a player or two might hold out into camp. Not in the new CBA era, which is refreshing. Guys who haven’t proven anything in the league shouldn’t be battling over money. One of the major positives of the new system is the ability to get young draftees signed up quickly. Now it’s up to the 2013 class to help push this team onto another level. One of the more interesting things to emerge this week is an apparent leak of the Cowboys 2013 draft board. If you allow camera’s into a draft room, there’s always a chance you’ll see the board. And that’s what’s happened here. Personally, I don’t see what the fuss is. Who cares if we know the Cowboys had a fourth round grade on E.J. Manuel? Will the world stop turning if it proves to be a mistake? Will it make any difference what so ever to Manuel’s chances of succeeding in Buffalo? Of course not. I’m not sure why there’s a wall of secrecy post-draft. Teams might argue they don’t want to get shown up. Well, that can happen anyway. The only way to avoid embarrassment completely is to not take part in the draft at all. Sit it out. The fact is you’re just as likely to be praised or criticised for the decisions you make publicly (who you draft, who you pass on). So what’s the big deal? It irked me a little bit that nobody asked Pete Carroll or John Schneider about San Francisco trading right in front of them to draft Vance McDonald. I guess those in a position to ask assumed they would get short shrift. But it’s a legitimate line of questioning and I want to know whether the Seahawks were considering taking McDonald before that trade. Were they usurped by a divisional rival? I also wanted to know if Seattle was thinking running back in 2010 before both Houston and Cleveland moved above them to grab Ben Tate and Montario Hardesty respectively. These are not unfair questions. Essentially, the Seahawks didn’t do anything wrong in sitting tight. It’s not like they can be criticised. They have no control over who moves above them. Yet we’re none the wiser on what exactly happened there. Perhaps a member of the San Francisco media could’ve asked why the 49ers felt obliged to move above Seattle? Perhaps someone did ask and I just missed it? However, I think teams could be more open post-draft. Let’s learn more about the process. Why not? The Cowboys board leaking is interesting because we see they only had 134 players listed. It’s always fun to hear people refer to ‘their” top-300 boards (you know who you are). Teams narrow these things down to the Nth degree. There’s no need to look at every player and create an all-inclusive ranking system. It’s an inaccurate science. One player who fits for team A won’t be a match for team B. It’s way better to pick out certain players who fit scheme and physical characteristics. I think Seahawks fans have a decent grasp on what to look out for after four drafts with this front office. Jordan Hill is the only player Seattle drafted that is listed on Dallas’ board and he was given a third round grade. There’s some reassurance if you needed it. You shouldn’t need it, because this team drafted Russell Wilson. Amongst others. Just to go back to Manuel and Dallas’ fourth round grade, it shows how weird the quarterback rankings where this year. Buffalo seemingly was always taking a quarterback. They could’ve easily put Manuel, Matt Barkley, Ryan Nassib or Geno Smith at the top of their board. And whoever they passed on was going to sink like a stone. First round or fourth. What a difference. I’d guess a fair amount of teams had Manuel ranked in the fourth. Yet he goes 16th overall. 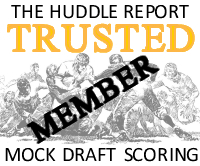 Dallas had Barkley, Nassib and Smith graded in round two. I’m amazed nobody took Barkley on day two, even just for value. A lack of quarterback need this year hurt him big time. Philly got a steal. Don’t be surprised if he ends up starting for the Eagles, maybe even in 2013. Likewise for Nassib, there was a surprising unwillingness from teams to pull the trigger — especially from those sporting ageing or mediocre starters. The Cowboys gave Eric Reid a second round grade — the Niners traded up to get him in the late teens. They also had #11 overall pick D.J. Fluker in round two and Atlanta’s #1 pick Desmond Trufant in round three (along with Tank Carradine, Kyle Long and Datone Jones). Christine Michael was not on the board. Neither were any of Seattle’s other picks apart from Hill. I remember speaking to a coach in another sport about a year ago and we ended up talking about injuries. I asked which was the more serious ‘common’ injury an athlete can get. I thought it was an ACL. He said it used to be. Times have changed though. Now it was the dreaded achilles. It’s pretty much an injury that never really goes away. It can go again with relative ease. And it hurts like hell. It’s not impossible to make a full recovery — Demaryius Thomas has shown it can be done. But it’s a tricky one. San Francisco are the definitive division rival, but I don’t want to see the Seahawks win the NFC West because of an injury advantage. That’s how close the teams are these days. An extra injury here or there could be the difference in 2013. And losing Crabtree is a big one. Back in 2009 I was desperate for Seattle to draft Crabtree with the fourth overall pick. He wasn’t the fastest or the biggest receiver, but he had everything else. Amazing hands, the ability to catch away from his body, incredible control, the tendency to make difficult grabs in coverage and he was the key component in college football’s most exciting finish to a game in 2008 (Texas vs Texas Tech — not RS freshman Earl Thomas’ finest hour). Crabtree was a star in the making. I felt positive about that. I remember shouting loudly and angrily at the screen when the Seahawks snubbed the best player in the draft for Aaron Curry. It’s easy to sit here and say that now, I guess. Yet it still hurts to this day. I remember getting excited that the reliable Mike Mayock had included Crabtree at #4 in his last gasp mock draft. I remember the split screen of Curry and Crabtree in the green room. I remember the blood curdling shout I made that probably woke the neighbours up when Curry’s name was called. It wasn’t a good day. Instead the Seahawks went safe — overpaying for an old veteran (T.J. Houshmandzadeh) at receiver. Crabtree was too risky for Tim Ruskell. He hadn’t worked out due to a metatarsal injury and there were some lingering character issues — although nothing too specific. Forget the fact Seattle was desperate for a dynamic receiver to help the ageing Matt Hasselbeck. Let’s spend over $100m on three linebackers instead. I think Crabtree should be a Seahawk right now. I think he’d fit very well as the bigger target in this offense. And I think a coach like Pete Carroll would’ve got the best out of him, much in the way Jim Harbaugh has in San Francisco. It’s no surprise either that when the 49ers had a settled offense and quarterback, Crabtree has played like the top receiver many expected he would be. Crabtree — just like Alex Smith — suffered with the bad leadership and constant change that franchise endured pre-Harbaugh. Last year he struck up an instant connection with Colin Kaepernick and they threatened to become one of the best — if not the best — QB/WR combo’s in the league. So while it’s obviously good news for the NFC West and NFC in general that Crabtree may miss the season, nobody should take any satisfaction from that. You should want to beat the best to be the best. And that means facing San Francisco with the Kaepernick-to-Crabtree connection. You build emotional attachment’s to players you respect in the draft process. Crabtree, even as a 49er, has my respect. And hopefully he’ll be back quickly for future battle’s with Richard Sherman and co.
Oh, and by the way, Jesse Williams can jump. Pete Carroll finally addressed the PED issues today in light of Bruce Irvin’s four-game suspension. He claimed the Seahawks go beyond what the league insists to keep the players on track, to understand their responsibilities. Carroll voiced disappointment and admitted it was serious, but there was no anger in his words. He was philosophical. More like a let-down father than a boss reaching tipping point. It was typical Carroll-fare. Not that this is a bad thing 99% of the time. Usually the boyish enthusiasm, positive mental attitude and slogans get me as pumped up as a player waiting to run out at Century Link and beat the 49ers 42-13. However, I just kind of wanted to see a stronger stance today. I wanted to see actions condemned, warnings made. This is five suspensions in two years. Five. The NFL Network is already talking about ‘asterisks’. There’s been so much good work during the Carroll/Schneider era to turn this team into a contender. Too much good work to let it go to waste. Nobody wants to see those efforts undermined. And I guarantee they will be undermined if any more players are suspended for taking PED’s. And just when you want to move on and concentrate on football, the news breaks that Josh Portis has been arrested for a DUI offense. Look, regulars know this isn’t a negative blog. We don’t search out reasons to criticise for the sake of it. I like to think we’re honest and ‘call a spade a spade’. In the last three years there’s not been a great deal to complain about. However, this isn’t good enough. Too many players are jeopardising their own careers, the success of the collective roster and they are not representing the franchise, the fans and the community in the correct way. Nobody expects to see choir boys. When you put 50-60 guys together on a roster there’s going to be a few issues here and there. Seattle isn’t the only team to experience problems like this. But PED’s and DUI’s are unacceptable and there have simply been too many. When there’s an issue — and there clearly is one here — I want to know there’s a consequence. Stuff like this cannot be taken lightly. Of course Carroll isn’t totally to blame for a fairly tepid response today. The media didn’t ask one challenging question in the entire press conference. It was an easy ride. I wanted to see a few tough questions thrown in there. Not because I wanted to see Carroll squirm, but because I felt that is what needed to happen. It’s that serious. – Why do you think so many players on this particular roster been caught taking PED’s? – Have you upped the stakes in terms of the consequences for the next person who gets caught? – Have you been disciplined enough with this group? Is that a fair criticism? – Does there need to be a culture change within certain pockets of the locker room? In certain situations coaches and GM’s have to be held accountable. We didn’t see that today and it’s disappointing, especially given the wall of silence in the immediate aftermath of the Irvin charge (well summed up by John McGrath at the TNT). Rest assured there’ll be a lot of tough questions asked from the national guys if the Seahawks win a title and it’s tainted by numerous PED suspensions. As I said a few days ago, zero has to be the maximum number of additional charges going forward — or credibility will begin to be challenged. This has to stop now. And just when you think it can’t get any worse, there’s talk today they’re going to drag the draft out until May. Meaning longer to wait, longer to dilute the process and more time having to listen to people banging on about whichever quarterback they love/hate on Twitter. Seattle’s former 1st-round pick Bruce Irvin has suspended without pay for violating NFL policy on performance-enhancing drugs. Bruce Irvin. Brandon Browner. Winston Guy. John Moffitt. Allen Barbre. That’s the list of Seahawks players suspended in the last couple of years for taking performance enhancing drugs. Richard Sherman was also charged, but won an appeal against his suspension. Seattle needs to get a grip on this — and fast. Everyone needs to take responsibility here. The players need to wise up. Learn what you can and can’t put into your bodies. Engage your brains. The vast majority of NFL players manage to avoid suspension. Why? Because they don’t allow substances like Adderall into their blood stream. It’s not that difficult. The coaching staff needs to do a better job disciplining the players and making sure they realise the consequences of being suspended. These four-game absences are costly. The Seahawks can’t afford to lose Bruce Irvin with Chris Clemons and Greg Scruggs suffering ACL injuries. Irvin will miss a crucial divisional game against the 49ers. His absence won’t define the contest but you’d rather have him out there on the field instead of sat at home watching on TV. What a waste. And yeah, I know that Adderall doesn’t exactly turn you into the Incredible Hulk on the football field. I’m led to believe it helps you concentrate, keeps you alert. Big deal. It’s banned. Therefore you don’t take it. Simple, really. It’s time to act like professionals. You’re not the only ones getting caught, but is there another team in the league that’s had five players suspended for PED abuse? It’s all well and good apologising, but it won’t change anything. Irvin posted an apology on his Twitter account. Bruce, seriously, you can’t play the “haters” card today. True, loyal fans aren’t just the blind faith brigade. Sometimes the truth hurts. You made a mistake. Deal with it, move on and please learn from this. This is a problem. It has to stop NOW. No more suspensions has to be the maximum going forward. Zero. And everyone is responsible for making sure that happens. I was going to write a post for the Seahawks draft in a similar style to the other NFC West draft writeups, but I didn’t get far in before I started to realize that it read like a re-run. So instead, I’m just going to throw up a few quick additional thoughts that I didn’t express in my immediate post draft reaction. I don’t know if Spencer Ware is going to make our roster, but I really hope he does. The more I researched him after the draft the more impressed I became. Ware has speed that I’d compare to Justin Forsett, but more than makes up for it with Marshawn Lynch type agility and outstanding resilience/balance on contact. If Seattle has ever drafted someone worthy of a Marshawn Lynch comp, it’s Spencer Ware. For one game at least, Matt Waldman once opined that Spencer Ware was a better back than his then teammate Stevan Ridley. Stevan Ridley, the guy who just rushed for 1200+ yards in New England last year. Ware probably won’t make the team as a traditional running back, but can you imagine if he became a quality fullback with that kind of versatility as a pass catcher and runner? It’s a lot of fun to think about. Especially in Seattle’s offense where the fullback is a versatile position and is a major part of the offensive game plan, even in the passing game. I hope Seattle doesn’t rule out Ware as a runner, either. If given a chance to carry the football, I could see him as being a slower yet more elusive version of Chris Ivory. For the second straight offseason, the Seahawks let Steven Hauschka twist in the wind during free agency before eventually signing him to a cheap one year deal. The Seahawks waited so long that I began to wonder if the draft might have been “plan A” for the kicker position. In a surprise move, Seattle signed Hauschka back just a few days before the draft, then didn’t even bother adding another kicker from the draft process. Steven Hauschka has done a terrific job with the Seahawks. Under fifty yards he was perfect last season: 23 for 23. From fifty plus he was 1 for 4. The NFL average for fifty plus is around 50%. If Hauschka makes just one more long kick he’s at the NFL average. You don’t have to be a statistician to know that 4 attempts is a small sample size and shouldn’t be taken all that seriously. Tim Tebow completed 75% of his passes last season in just 8 pass attempts. See what I mean? Josh Brown regularly nailed 50+ yard attempts while struggling for distance on kickoffs. Hauschka has plenty of leg on his kickoffs so I don’t think there are any physical limitations in play. Remember too that Pete Carroll once trusted Hauschka with a 61 yard attempt to decide a game. He failed miserably, but Pete wouldn’t have made that choice if he didn’t at least think Hauschka had a strong leg. Some have pointed out that Seattle had a very high number of punts inside the opponent’s 40 yard line last season. That and Hauschka’s very low number of 50 yard attempts does seem to hint at a lack of confidence, doesn’t it? Seattle arguably lost a game last season (at Rams) because of the difference in kicker range, and that game would have been the difference between a wildcard and a bye. Amazing how little things add up, isn’t it? Those concerns are fully valid, though I think it has more to do with Pete Carroll’s new found conservative approach to decision making. “Big Balls Pete” has been burned more than a few times, and every time it happens he becomes more and more hesitant to take chances. Statisticians frequently point out that going for 4th downs is actually a very smart thing, and I can’t imagine that opting for a punt at the 35 yard line is ever optimal as a long term approach. Pete Carroll’s position is as secure as it gets in the NFL right now- I think it’s time he put his fears behind him and brought “Big Balls Pete” back. Ironically, it’s that overly conservative trait that has helped Hauschka remain in Seattle. Going 23-23 from under fifty goes a long way for a coach that progressively seems to be more and more risk averse. The Seahawks are a great team with high expectations, and in my opinion Steven Hauschka deserves to be our kicker. Given his phenomenal short range accuracy, distance on kickoffs, and small sample size on long kicks, I see plenty of evidence that suggest he could be a good kicker from longer range in the future, should the team put more trust in him. Seattle needs to punt less from inside the forty, but I think that’s a lot more on Pete’s shoulders than Hauschka’s. Nothing shocked me more than hearing John Schneider casually mention during a post-draft press conference that the team had decided to not draft any quarterback this year, and that decision was made before the draft took place. That’s pretty crazy when you consider Seattle’s current backup situation and the kind of value that fell into day three (and undrafted free agency) for the position. Now we know why Seattle kept passing on Matt Scott and others. For a guy that came from Green Bay, where they preach drafting a quarterback every year, John Schneider has been anything but. Sure, he’s stocked up on quarterbacks, but nearly all of them came from trade or free agency. The only quarterback to actually be drafted during this regime is Russell Wilson. So I guess the next question is “why?” The most logical answer is that they really like their current group of young veteran backups. Brady Quinn has been a terrible NFL quarterback, but he’s also a former 1st round pick and isn’t without talent. Seattle briefly brought in former 1st round pick JP Losman in 2010 who was a similar story. They courted former first round pick Matt Leinart and allegedly had discussions behind closed doors regarding former 1st round pick Tim Tebow. They went hard after Chad Henne last year. Henne just missed being a first rounder. So I think in Seattle’s mind, they are always looking for quarterbacks with talent, even if they were miserable washouts elsewhere. I imagine that Blaine Gabbert’s agent will probably get a call from Seattle in the next few years. While I hate missing out on Matt Scott, I also appreciate that he is a highly injury prone player who played at just 210 pounds. He’d be a big risk for injury every time Seattle ran a read option play. Jerrod Johnson offers a similar package of mobility and arm talent in a body that’s 40 (!) pounds heavier. Johnson had a terrific junior season before crapping the bed in his final year at Texas A&M. And though he only threw 21 passes last preseason, those 21 passes added up for a preseason YPA of 11.2 and a preseason passer rating of 136.2. His lowest passer rating in any of those appearances was 118.8. This was a small sample size compounded by preseason competition, but it’s not nothing. And he’s only a year older than Josh Portis. Imagine how we’d react if Josh Portis had been that impressive last preseason. Johnson gives a surprisingly good interview as well. He may not have a ton of future trade potential, but I don’t see why he couldn’t be at least another T-Jack. That leaves us with Josh Portis, who kind of got railroaded by a quarterback competition last year that left him almost no reps and threw him into a Raiders game with nowhere near adequate preparation. I think the staff took the lesson of last preseason to heart and decided that four preseason quarterbacks is enough. That might have been a factor in the decision to not draft a quarterback as well. I get that Seattle wants to get Jesse Williams on the field this season, but giving him the Alan Branch role is not going to end well and given Pete’s willingness to adapt I suspect it will only be temporary. Jesse Williams is a fantastic run defender but has short arms and showed essentially zero pass rush ability in college. He’s a pure nose tackle, and should be used as such. That said, he has the tools to replace Red Bryant as the run defense 5-tech specialist, and quite honestly I think that’s the politically incorrect reason that they actually drafted him for. Going out and announcing such right now in the open would be bad for relations with Red Bryant and given his leadership role on the defense it could cause locker room divisions. So I get it. Williams will “officially” be our 3-tech until some future undetermined time that Seattle opts for a new direction with Red Bryant. Seattle has done a good job keeping these intentions (real or not) away from the noses of the press. Even still, I hope Williams only sees action at the 3-tech when it’s very likely to be a running play by the opponent, because those are the only plays you’ll want to see him out there barring a revelation from Dan Quinn. Chris Harper is the one pick I just can’t get excited about. In a way, he’s a little like Landry Jones the receiver. Both are guys with the kind of size and physical talent to be high picks, but both have games that are so bad you wouldn’t be blamed for taking them completely off your draft board. Chris Harper’s performance against Baylor was almost unwatchable, and it’s not like his struggles were isolated to just that one game. He gives up on plays, stabs at the ball with poor catching technique, frequently looks clueless when the ball is in the air, fumbles often, and struggles to separate. When I scouted him over three games the negatives overwhelmed the positives. 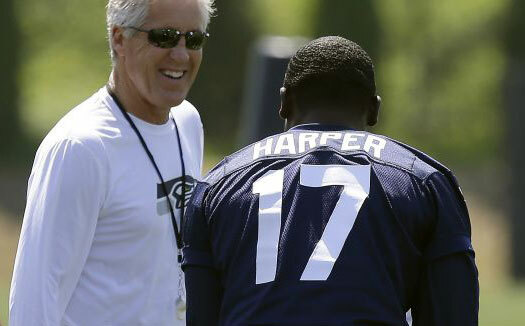 That said, the Seahawks know perfectly well what Harper’s issues are and they drafted him anyway. When most other front offices do this, I’d unflinchingly call it a mistake, but when Seattle does it they always do so with a specific plan in mind for how they will address that player’s weaknesses and problems while getting the most out of his unique strengths. Maybe their plan fails and Harper ends up a miserable bust, but you can’t say that Seattle made this pick on the seat of their pants or without knowing what they were doing. Harper is pretty unique. He’ll be one of the NFL’s heaviest receivers on day one, and of that list of heavy receivers, not many stand 6’1″ or less. That bulk will help Harper defeat press attempts better than most, and given the direction the league is going, we’ll probably see a majority of teams running press coverage within a few years. Harper wouldn’t have been my choice, but if you just wanted a guy that can beat press, Harper was the best there was in this draft class. I really hope Tharold Simon can stay focused and motivated here in Seattle. He wasn’t perfect at LSU by any means, but when he looked good he looked very good, and like Richard Sherman he’s got a bit of a “cocky” streak in his personality that makes him fun to watch. John Schneider clarified that he traded up for Simon, not Williams. Clearly, he was a player they felt they needed to get. Last thought. After the 2012 draft John Schneider talked about how the two players he felt he had to walk out of there with were Bruce Irvin and Russell Wilson. Recently John invoked that anecdote when discussing 5th round tight end Luke Willson, saying that Willson was the one player this year that they felt they needed to leave the draft with. It’s not every day you hear that kind of talk for a guy that was selected 158th overall and was the backup tight end for Rice. But you don’t find 251 pound tight ends that run a 4.51 forty every day. Those numbers are almost identical to Saints’ tight end Jimmy Graham. And when you do find specimens like that, they usually have almost no experience or skated by on athleticism instead of intelligence. Willson was a 3 year player at the position with some production before 2012, and he gives such a professional interview that you’d be forgiven for thinking he was a coach. Similar to Chris Harper, Luke Willson may not be an all-world player on film, but for just one unique purpose he’s tough to beat. Tight ends that run a 4.51 are really tough to defend and will likely force defenses to run more nickle packages. Expect Willson to lead the team in yards per catch, because when he does get targeted, it will usually be on a deep route while being covered by a linebacker. If Wilson finished with more than 20 catches next year, I’d be surprised. But those catches could easily add up to 300 yards and could force defenses to make adjustments when he’s on the field. Even if he’s not targeted, should his presence force the defense to use a nickle package or take a safety out of the box, that means Willson is adding value to Seattle’s running game. That ability to stretch a defense matters even more with Percy Harvin on board. Harvin’s bread and butter in the bubble screen. Considering how much of Seattle’s offense is built around short yardage plays, it’s easy to see why such a high premium was placed on a player that can stretch the field from an area that the previous version of the team could not threaten deep from. You can see the press conference by clicking here. Earlier in the week Carroll praised tight end Luke Willson (why the extra ‘L’ Luke… why?) for his display. He’s an intriguing guy. There’s not a great deal of tape out there, but any time the team brings an athletic ‘catcher first’ tight end into camp you can’t help but want to see more. Those types of players are changing the NFL as much as anything. Seattle’s offense has lacked a difference making athlete at the tight end position (that’s no slur on Miller or McCoy, I’m a big fan of both). We’ll see if Will.son can be the next out of nowhere field stretching big man. Perhaps even more interesting, however, were Carroll’s comments about the defensive tackle position. He talked about not putting players into a discomfort zone (yes, I am making up an opposite to ‘comfort zone’). That meant Jordan Hill mostly featuring at the nose or one technique. Yet Jesse Williams featured at the three in mini camp, a position he isn’t that familiar with. He played the five and then the nose at Alabama. So what gives? Clearly the Seahawks believe in Williams and his ability to start. The fact they’re already trying to get a good look at him at the three might give him an edge in terms of who eventually wins the starting job to replace Alan Branch (even if there’s still a long way to go). Unlike Hill, they’re trying to mould Williams early. They’ve done this in the past with their rookies (see: Russell Wilson taking ALL the snaps in mini-camp last year). Carroll even stated he feels Williams could start on first and second down. They appear to want size early. They want to play tough against the run. They started with Colin Cole at the three, switched to Branch and Williams could be the next man up. Of course, he still has to prove capable and stay healthy. He’ll need to impress. But it looks like he has a great shot at winning a starting gig. Yet I can’t help but wonder how they see Hill fitting into the equation. Rotational cog for Mebane? Pass rush specialist? After all, he was the third round pick. Not Williams. I figured they might push Hill into the three early to test him there. It may still happen. But this week they kept him at the one and Carroll didn’t tout any eventual change of position in his interview today. We’ll see how this process plays out. While this won’t be anything like last years quarterback saga going into camp, the ‘who starts at defensive tackle’ debate will at least keep things interesting. Can Williams win the job at the three? And if so, how does the higher draft pick fit in the rotation? Williams wears #54 in the videos below. Big thanks to JMPasq who put these together especially for SDB. The guy is a legend. Aside from the two noted above, Chris Harper (WR), Jesse Williams (DT), Luke Willson (TE), Ryan Seymour (G) and Jared Smith (G) also agreed terms today. The players who remain unsigned are Christine Michael (RB), Tharold Simon (CB), Spencer Ware (RB) and Michael Bowie (T).